UPDATE Nov 2018 - V2 of the software has now been released to support the new CL_SPU_USB & BLDRV3 driver cards. 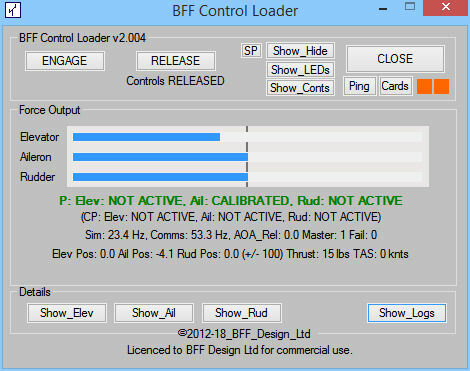 The BFF Control Loader V2 software is used with our CL_SPU_USB and BLDRV3 motor driver cards in flight simulator flight control loaders. It extracts live telemetry from FSX/P3D and X-Plane flight sims and instructs real-time loading of brushless drive motors in the flight controls. Realistic GA trim behaviour (independent of simulator trim system, controls can be trimmed in any position) using trim potentiometers or trim buttons/switches. Helicopter cyclic trim loading mode. Sim-Avionics & ProSim, and also Failure Mode Loading. USB Dongle support for unlock key portability. When used with the CL_SPU_USB + BLDRV3 brushless motor drivers the CL software exports flight simulator dependent force components at approximately 55Hz. These are added to the force components calculated onboard the BLDRV3 card at 500Hz. 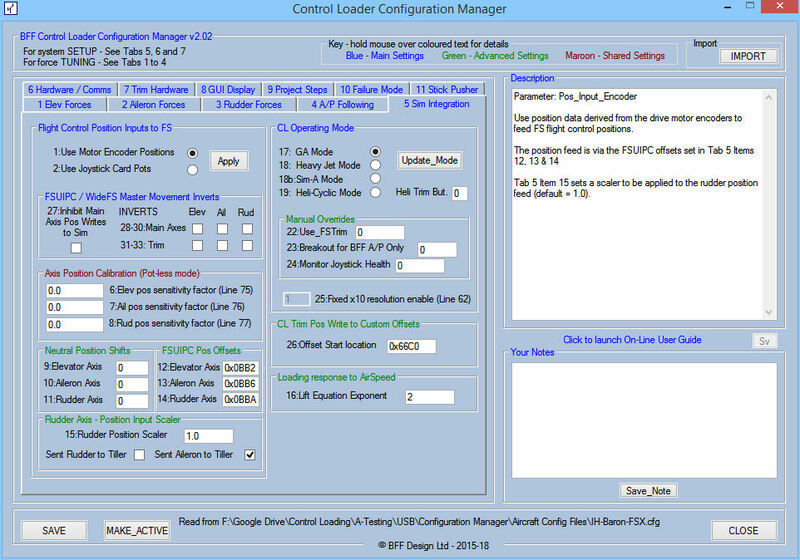 The on-board force processing of the BLDRV3 allows the CL software to run with minimal system resource which allows it to run on the same PC as the flight sim. The included Configuration Manager application allows the configuration settings to be adjusted and saved in configuration files and to be updated in the main CL software as it runs. This allows the force effects to be tuned with the CL system active. Runs on Windows 7+ PC's. The loading calculation model has been developed to provide effective force demands for low cost self-build systems (compared to commercial control loader systems) and is principally based on the behaviour of GA aircraft with reversible controls. Additional modes are available for heavy jet operations. The model uses control axis position and velocity as the indicator of control surface position and velocity, this is measured at the brushless motor quadrature encoder. Airspeed, aircraft AoA, accelerations, engine condition, runway speed, stall state and other dynamic flight data are all taken live from the flight sim (FS9/X or X-Plane). Trim surface position is taken from the independent trim pot positions or trim button/switch operation. Aerodynamic loads are calculated from control surface deflection and aircraft AoA and airspeed. 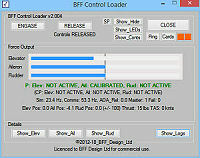 The airspeed exponent used in the calculation of control surface lift can be adjusted to suit different control types. For small aircraft with controls mechanically connected to the control surfaces airspeed squared can be set. For fly-by-wire systems a linear relationship can be set (stiffness varies linearly with airspeed). The model allows control forces to be calculated without the need to monitor applied loading and this greatly reduces the complexity and cost for self-build systems by avoiding the need for force sensors in the controls. For Auto Pilot following the CL_SPU_USB + BLDRV3 cards switch automatically into a PID controlled position following mode and the CL software generates position demands based on the A/P control actions read from the flight sim. The A/P following can be disengaged by moving the controls or by the usual sim panel controls. A/P following can be disabled if not required. Note that the A/P following functionality is active for the simulator software's native A/P system only - not for external A/P packages. UPDATE - A/P following for Sim-A and Pro Sim are now also available. To operate effectively the software must be used in a properly designed and built system as described on the BLDRV3 page. The quality of the force feedback you obtain will be critically dependent on the quality of the design and build of the force transmission and other mechanical elements in your controls. The previous CL Software web page and versions is here.